The Republic of Namibia is a country in southern Africa on the Atlantic coast. It shares borders with ► Angola, and ► Zambia to the north, ► Botswana to the east, and ► South Africa to the south. It gained independence from South Africa in 1990 and its capital city is Windhoek. 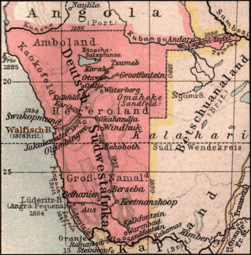 Die Republiek van Namibië (vroeër bekend as Suidwes-Afrika) is 'n land in suidwestelike Afrika, aan die Atlantiese kus. Dit word deur Angola en Zambië in die noorde, Botswana in die weste, en Suid-Afrika in die suide begrens. Die Republik Namibia ist ein Staat im südlichen Afrika. More images Namibia - Namibia (Category). This section holds a short summary of the history of the area of present-day Namibia, illustrated with maps, including historical maps of former countries and empires that included present-day Namibia. This page was last edited on 3 December 2017, at 10:14.